Say hello to Jesus Christ or at least an early representation of the guy. 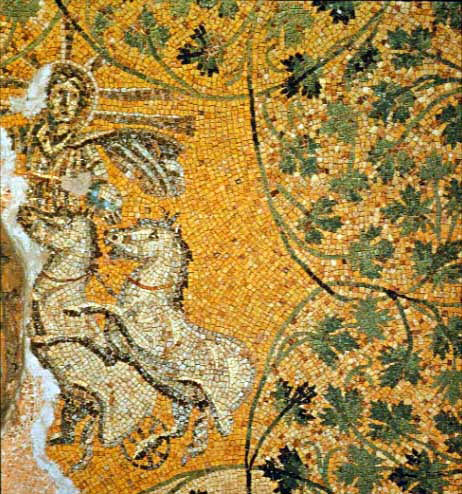 This image (Thank you to our friends at http://commons.wikimedia.org) is a photograph of a mosaic created in the late 3rd century, CE. Scholars say that it is combination of the earlier sun god and the newer man god. It’s that time of year when the believers get serious about celebrating their beliefs. I’ve seen a few amazing things and have nothing against believers. I do get a little creeped out by the hell and brimstone death cult churches. I’m even more creeped out by the “prosperity” churches. Pray and get rich seems a bit strange for the guy who threw the money lenders out of the temple. A long time ago, a preacher told me that it didn’t matter what you believed in, as long as you believed in something. From the preachers perspective, a belief system gives you a framework for processing the things that happen in life which are beyond understanding and to give you a moral compass for navigating the planet we find ourselves on. For me, the idea that anyone can know the truth about life, the universe and everything (spoiler – it’s 42), is just plain silly. To think that mere human beings have the intellectual capacity and appropriate sensory inputs to understand much of anything seems beyond arrogant to me. None-the-less, a lot of the world believes and who am I to tell them they’re wrong. The GrumpCast welcomes Preacher Fred; our new religion and cults editor.